Silhouette from the Skylit played two shows at Nipponcon in Bremen on June 6 and June 7, 2015. Just before their first overseas show ever, miji-p got the chance to ask them about their current releases, their shows at big Japanese festivals and the crazy things guitarist Rockwell did when he was drunk. 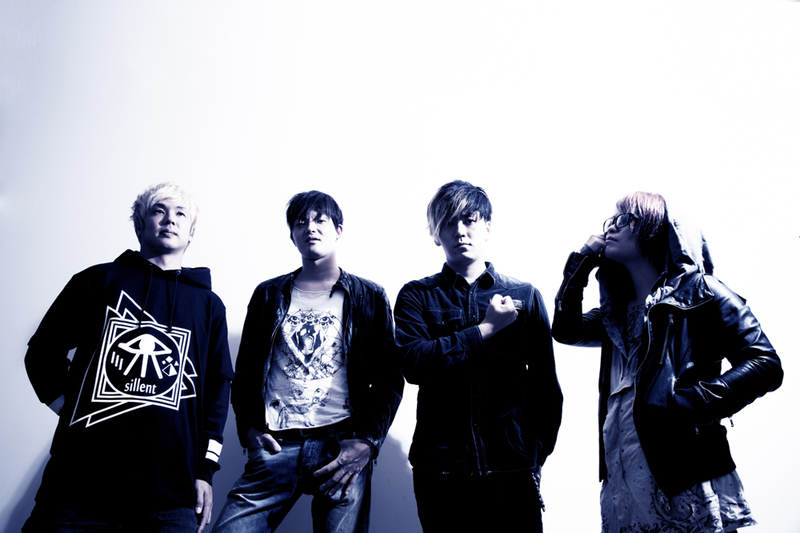 Please enjoy our interview with Silhouette from the Skylit! Hello guys! Please introduce yourself at first. SeishiroX: I’m SeishiroX on vocal. Rockwell: I’m Rockwell on guitar. I like animation … and takoyaki! K.O.U: I’m K.O.U on drums. I love dogs! This is your first time playing abroad and also your first time in Germany. How do you like it so far? Rockwell: The meals are great! SeishiroX: And the beer is tasty! Also, we saw no homeless people so far, which is good. It seems to be a clean and safe country. Rockwell: We also had an interesting discovery at the toilet. People here talk when they go to the toilet and they are even laughing a lot! In Japan it’s totally different. “Blue Echo / Closer” is your latest single. Please tell us more about how it was created and the songs on it! Rockwell: Well, we wrote the melody over and over again, then we scrapped it and started again. But it’s hard to put into words what we had in mind. SeishiroX: After all, we wanted to create a song that blows everyone away on a live. A song which we could sing and shout together with everyone there. And of course we also wrote it with a lot of passion! Your last album “The Reflections” was released almost one year ago. Can we expect new music soon? Everyone: We are producing one right now! SeishiroX: But it’s still in the making. We don’t know yet when we will release it. Rockwell: We are doing our best! SeishiroX: If possible, we really want to release it this year already. In 2013, you won the Red Bull Live on the Road contest and the first prize was a recording in New York, USA. What was it like to go there and to record the “Blue Echo / Closer” single as well as the PV for “Blue Echo”? Rockwell: It was fun! The world we only knew from TV until then was suddenly becoming real in front of our eyes and we could really see and experience it. That was amazing. K.O.U: It was really nice. But I like Germany better! Tetsurow: Of course it was much fun. But I prefer German food, cause it tastes better. SeishiroX: I drank too much Red Bull! Every day it was about four or five cans of Red Bull for ten days straight. Rockwell: Because of this he was wasted every day! As for me, I got up around 7:00am every morning and went for a walk through the city on my own for one or two hours. SeishiroX: For me it was a bit hard, cause I caught a cold in the airplane and together with the jet lag it was really tough. Because of this, I could never go out in the evening but went straight to bed. That made me sad a little, cause I really wanted to see more! In Tokyo, you played at Summer Sonic 2013 and also on Knotfest 2014, two of the biggest festivals in Japan. Comparing big festivals and shows in small clubs, which do you prefer for a live? Tetsurow: Festivals are fun! But since those two are so huge, you can’t compare a show there and a show at a normal club. The feeling is totally different! K.O.U: At a club, we are very close to the fans and experience their feelings directly. This is what I like about this kind of shows. Rockwell: I like playing at festivals. It makes me feel like I became a hero or something! It’s so crazy! SeishiroX: Well, I like both equally. Tetsurow: Anyways, if the feeling is right, it doesn’t matter where we play, both are great then. SeishiroX: But I would like to play on more and more festivals! Let’s do some fun questions! What is the strongest point of every band member? Tetsurow: I can cook well. And what is everyone’s weakest point? K.O.U: I don’t drink any alcohol. Rockwell: I hate when my mobile can’t connect. I become all cranky then. Tetsurow: I have absolutely no sense of direction. I can’t remember any route. What would be the perfect fan present for you? Rockwell: I think, getting only the love of the fans is enough, right? Tetsurow: I’m happy about letters! K.O.U: I also like sweets. What is the craziest thing you have done so far? SeishiroX: Okay, let me tell you my top 3 of Rockwell‘s crazy drunk adventures. Number one: When he was drunk, he made Yakiniku … and fed a man he didn’t know with it. (everyone bursts into laughter) He fed other people with it! … Number two: When he was drunk – after drinking all night long – and when the morning came, he met a tour group in Shibuya and took pictures together with them (everyone bursts into laughter again). And number three, the best one: When we were on stage, Rockwell wanted to do a backflip. But he failed and hit his head! It looked so painful! Rockwell: It was super painful! I thought I would die! … But these were only stories about me! Everyone: Because you are crazy! But it’s good, we like you being crazy. Why should people definitely come to a SFTS live? Rockwell: I have no idea either! (laughs) But I guess it’s the feelings of the people who come to our lives. You know, we think it’s fun to look at us on stage, but when we see the faces of the audience, we can see that they have a good time and maybe think “it’s good to be here and it’s fun”. It’s this kind of feeling that is transferred. Thank you very much for the interview. Please leave a message for the readers on miji-p! Everyone: Please make some noise for us and call out for us so we can come back! Thanks to Silhouette from the Skylit and our partner JM:SiXXX for making this interview possible! Please check out the profile of Silhouette from the Skylit on miji-p to find out more about this great rock band! Posted in: Interviews. 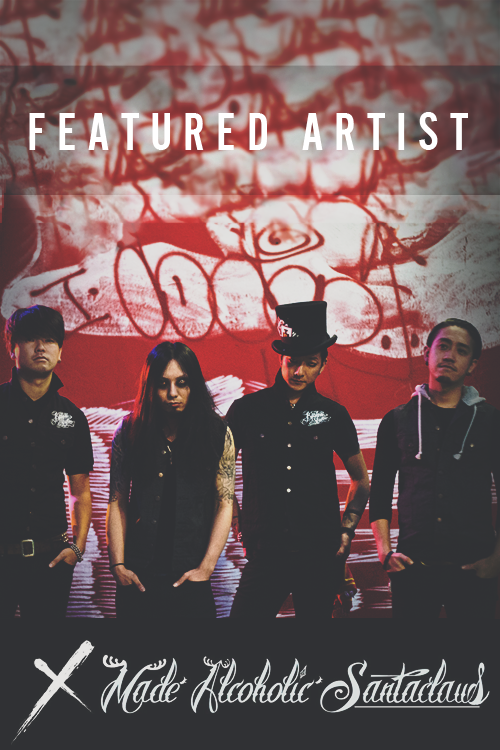 Tags: Interview, SFTS, Silhouette from the Skylit.